Apocryphal. Born to the nobility. Learned in science and oratory. Converted to Christianity after receiving a vision. When she was 18 years old, during the persecution of Maximinus, she offered to debate the pagan philosophers. Many were converted by her arguments, and immediately martyred. Maximinus had her scourged and imprisoned. The empress and the leader of the army of Maximinus were amazed by the stories, went to see Catherine in prison. They converted and were martyred. Maximinus ordered her broken on the wheel, but she touched it and the wheel was destroyed. She was beheaded, and her body whisked away by angels. Immensely popular during the Middle Ages, there were many chapels and churches devoted to her throughout western Europe, and she was reported as one of the divine advisors to Saint Joan of Arc. Her reputation for learning and wisdom led to her patronage of libaries, librarians, teachers, archivists, and anyone associated with wisdom or teaching. Her debating skill and persuasive language has led to her patronage of lawyers. And her torture on the wheel led to those who work with them asking for her intercession. One of the Fourteen Holy Helpers. Suffered in the persecution of Decius, but survived. Renowned for his knowledge of science and the Bible. Head of the catechetical school at Alexandria, Egypt. Bishop of Alexandria in 300. Opposed extreme Origenism. May have been the first to deal with the Arian heresy. 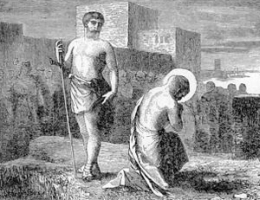 During the Diocletian persecution, Peter fled the area with many of his flock. Criticized by many for being lenient and forgiving to Christians who had renounced their faith during the persecutions. However, when a rogue bishop usurped Peter's position, the Meletian schism broke out in his clergy, and Peter had to return from hiding to deal with it. Peter excommunicated Meletius and convened a synod of bishops to condemn the schism. His writings were used in the Council of Ephesus and the Council of Chalcedon. Bishop Peter was martyred with Father Dio, Father Ammonius, and Father Faustus, three of his priests, in the persecutions of Gaius Valerius Galerius Maximinus. As he was the last Christian martyred in Alexandria by civil authorities, the Coptic Church calls him "the seal and complement of the martyrs". In 1273, at the age of thirteen, Beatice joined the Carthusians at the Charterhouse of Parménie, France. In 1301, she and two others, Luisa Alleman of Grésivaudan and Margherita di Sassenaye, were sent to found the monastery of Eymeu in the diocese of Valance, France. Noted for her devotion to the Passion of Christ, offering herself to suffer for others and as penance for the world. Said to have driven a nail through her left hand to help realize the sufferings of the Crucifixion. Brother of Saint Agatha Yi So-sa. Layman catechist in the apostolic vicariate of Korea. Imprisoned for four years, regularly beaten, several bones broken, and he eventually died from his mistreatment. One of the earliest of the Martyrs of Korea. Carthusian nun. Founded a Carthusian house at Eymieux, France. 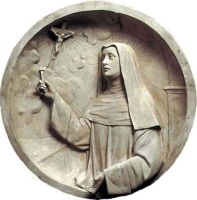 Known for her devotion to the Passion of Christ; said to have driven a nail through her left hand to help realize the sufferings of the Crucifixion. May have been of Jewish ancestry. Imperial Roman citizen. Priest. Noted preacher. Adamant opponent of the heresy of Novatianism. Correspondent with Saint Cyprian at the beginning of the persecutions of Decius. After the execution of Pope saint Fabian under Emperor Decius, he administered the Church with the help of the priests and bishops who were in Rome. Helped reconcile repentant apostates who were sick and about to die. Imprisoned for nearly a year for his faith. Martyr. Scythian Christian soldier who distinguished himself against the barbarian invaders of the Roman empire, and gained the notice of Decius. However, he refused to sacrifice to the pagan god Artemis, and so was tortured and executed. Some versions of his story include angelic visions and messages received in dreams, but his being a soldier and martyr is all we really know. Born to the imperial Roman nobility, and a sentator from Milan. When visited Saint Julius of Novara on the island of Orta he was so taken by Julius' obvious holiness that he gave him moral, spiritual and financial support in his evangelization work. Monk at Gorze. Abbot of Mönsterschwarzach, Bavaria, Germany. Benedictine monk at Casauria, Abruzzi, Italy. He retired to live as a hermit in the Caramaico mountain area near Chieti, Italy. There he attracted so many would-be spiritual students that he founded the Saint Nicholas monastery for them. Soldier. Ministered to the margraves of Thuringia until he was about 50 years old. He then became a Cistercian monk at Heisterbach Abbey in western Germany. Priest. Bishop in Syria. During a period of persecution of Christians, he fled to Mount Linanus and lived as a hermit for 17 years. Martyred in the persecutions of Licinius. Seventh century founder and abbot of the monastery of Lavaur in Gascony (in modern France). Soldier. Monk. 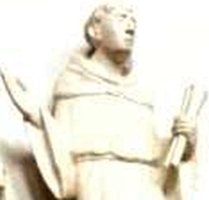 Abbot of Arlanza monastery, Burgos, Spain in 1039. Friend and counsellor of King Ferdinand I of Castile. Bishop. Murdered for his faith by a man named Macario in the reign of emperor Constantine. Martyr. Spiritual student of Saint Prosper of Reggio. Nun. Benedictine monk and priest of Ottobeuren in Bavaria, Germany. Known in his day as a "wonder worker". Benedictine monk at Farfa, Italy. Abbot of the monastery at Casauria, Abruzzi, Italy. Sixth century evangelist in the rural areas of Agen, Aquitaine (in modern France). Martyr. A group of 13 Christians murdered together for their faith in Africa, date unknown. The only details to have survived are their names - Claudian, Cyprian, Donatus, Felix, Januarius, Julian, Lucian, Marcian, Martialis, Peter, Quirianus, Victor and Vitalis.